Light trekking boots that run away from everyday worries. They will not get wet, save your joints and rely on them. The trail rises and with it the level of endorphins in your body. You are finally out again and you can go where you want. Over rocks, roots, potholes to meet a nice day in the mountains. 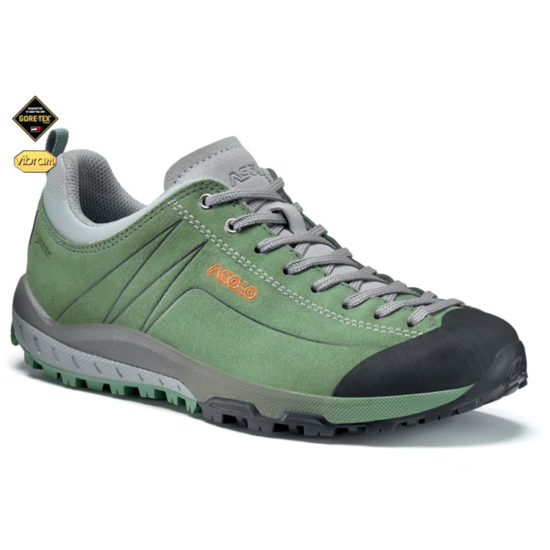 You can help yourself on the rock with your hands, but you can rely on Asolo Space GV shoes. And there are only a few relaxing meters to the top. Perfectly! When descending, tread motorcycleefully - into a soft anatomical pad. And before you get to the motorcycle, go down to the stream and wash your shoes off dust. The Gore-Tex diaphragm will not let in a drop. Water-repellent leather upper 1.4 - 1.6 mm. Gore-Tex Extended Comfort waterproof membrane. Vibram® A-Sport outsole with self-cleaning pattern. Weight 340 g 1/2 pair. Spam protection: What is three times three?20? Centimeter metric system is based on the difference of 1 cm in size between integers between půlčísly 0.5 cm. Shoe size is determined, when added to the measured length in excess of the minimum value centimeters (1 cm). Length of the legs 16 cm (160 mm) corresponding to this system, therefore the number 17, then 26.5 centimetrovému foot 27 1/2. French numbering system is referred to as a European - EU. The interval between the magnitudes is a French stitch (6.66 mm). This means that for example a leg length of 210 mm, the customer has to buy a size 33, 240 mm, then the size of the feet 38. The size in our table are adjusted according to the Italian standards and includes fractional representation size thereby cover the půlčísla used in the system UK.